The bond between a driver and their car can be so tight, words can not describe it. When shopping for a car, we typically look at the functional side (what type & size), then we look at ownership experience (reliability), and then its the image that it projects (the styling and accessories). The goal is to find the right combination of the three that triggers an emotion that makes just gotta have it! It might take time to develop this emotion and the buying decision might even take on function above everything else. My most recent car purchase was certainly a grand combination of functionality, ownership experience and image. Pulling into the Mazda dealership in my stripped down 2001 Ford Focus, with hand crank windows, hubcaps, and nothing more than a/c and a cassette player, and seeing the Mazda3, it was love at first sight. In fact, it was the beginning to something so fabulous, I grin every time I think about my car. While I had admired the Mazda3 in automotive magazines like Car and Driver and Motor Trend for years, I never really thought I would own one. My Focus, as boring as it was, was a good functional car that got me from home to work in relative cheapness. It never left me stranded, it never required a serious repair during the first 60,000 miles and it was comfortable for a stripper. Then came the day I took it in for service to complain about a strange noise coming from the front end. It wasn’t long before I got the call from the service adviser asking if I was okay with a $1800 bill to replace the bearings, shocks, and front brakes. I baulked. The car had nearly 80,000 miles on it and was starting to show its age; maybe it was time to think about that Mazda3. The one that all of the automotive journalists raved about, called it “their daily driver of choice” and photographed speeding around the race track in all of its glory. That one. Sleek styling makes this car a winner. After speaking with the sales guy and taking a test drive, I wanted one. What impressed me the most was the quiet interior, the throttle response, and the versatility of the 5-door with folding rear seats. I thought I could fit a lot in the back of my Focus, but this thing could even get the kitchen sink in. It was a Galaxy Grey one with black interior. The car looked like it was racing around a race track just sitting there. After stepping out of the driver’s seat after the test drive, I couldn’t get the Mazda tagline out of my head ‘zoom-zoom’ the voice kept whispering. “Geez, Mazda! you guys are good!” I said to myself in response. It took less than 30 minutes to clear the financial department, sign the title of the Ford over and drive off in my new zoom-zoom Mazda3. The emotional tie between driver and car had only just begun. Over the past three years, it is safe to say that I consider my Mazda3 more than my best friend, it is my life companion. From road trips where it happily zips along to windy back roads where it pretends to be a kid in the candy store, the Mazda is ready and willing for all kinds of adventures. It also swallows everything I can image in to put in it. As a triathlete it can swallow my bike, wetsuit, and the rest of my gear with ease. When a friend and I went up to the Santa Ynez valley for a lengthy bike ride, it swallowed both of our road bikes (sitting up), all of our gear, and even had room left over for a few cases of wine. Wow. 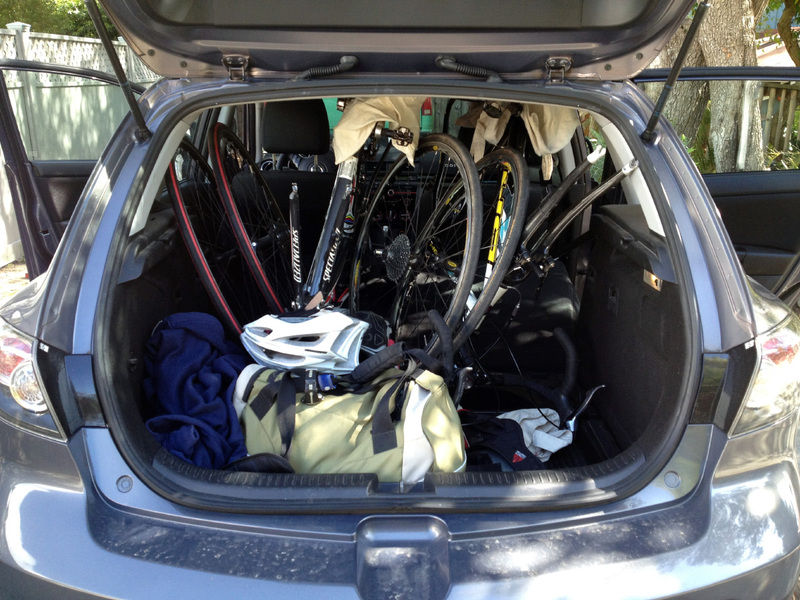 Two bikes, lots of gear and room for two cases of wine! The ride is smooth, yet sporty. The dash is readable and modern. The dash says “hello” to me whenever I turn the car on. The six disc in dash CD-changer keeps me entertained when not using the auxiliary jack with my iPhone. With cup holders galore and a seriously large glove box and center console, it is easy to lose stuff in the storage. The only thing not to like about it is the fuel economy. The Mazda3 can be quite thirsty at times going up hills and cruising at high speed. Even with hyper-miling, I have been unable to get the lifetime fuel economy beyond the 24.8 mpg average. But with so much else to enjoy, it is hard to really hold this against this car. Heck, gas is still far cheaper than what they pay in Europe, right? After 40,000 miles, I have yet to witness even a hicup. 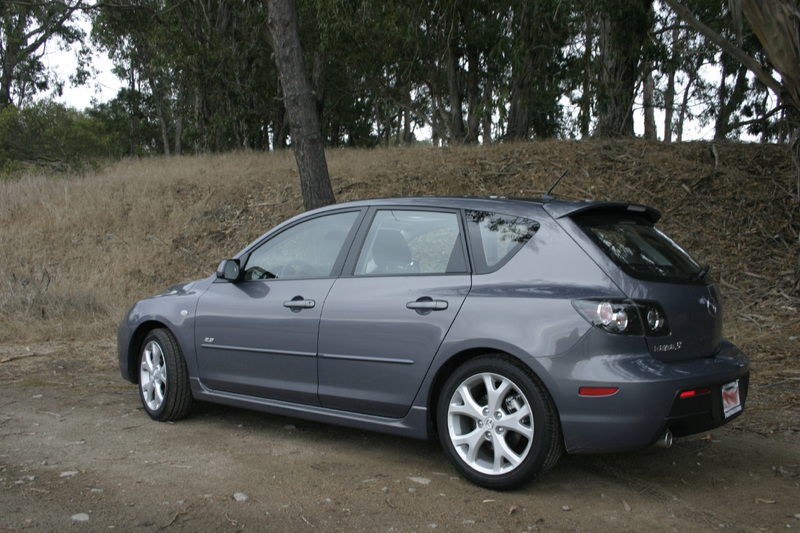 My zoom-zoom Mazda3 has been such a great car, I can hardly imagine driving anything else. With maintenance costs comparable (so far) to the Ford, the Mazda3 has been cheaper than expected to operate. My experience so far has turned into a huge fan of Mazda and this is coming from a guy that tries really hard not to get sucked into the “brand” thing. But Mazda’s brand is irresistible. I expect to have many, many more zoom-zoom moments with my Mazda3. The 2008 vintage sitting in the driveway is just getting broken in and will be the best companion for years to come. The emotional bond will only get better. 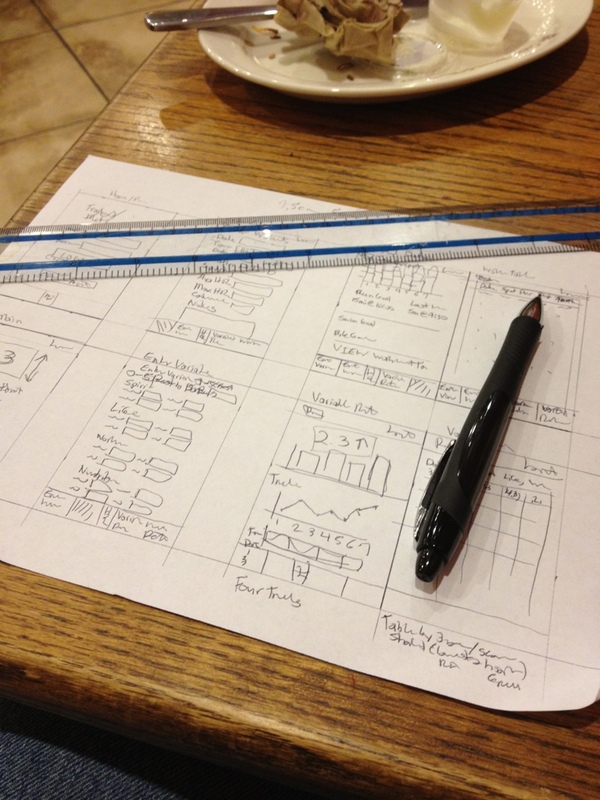 Why Starbucks VIA Ready Brew Will Succeed! Starbucks is certainly a company that knows how to sell coffee. Heck, it was Starbucks that helped save us from the percolated Folger’s of yester-year. They even saved us from those coffee crystals that our grandparents swore by for years. That is why many people are having a hard time with Starbucks’ new VIA Ready Brew instant coffee. How dare the king of coffee take us back to the product that they saved us from. However, this isn’t your grandparents’ coffee crystals. Sure I was skeptical, but I ordered a pack of each flavor, Columbia and Italian Roast, from starbucksstore.com to get an early taste here in California. As I tore open the stylish package and dumped it in the cup, I realized that there was something different about it. It looked absolutely nothing like the instant coffee that is currently on the market… it looked like coffee. Imagine that! Adding the water and stirring it up produced a cup of coffee not that far from fresh brewed and without the wait. Fresh brewed coffee, when done right, takes upwards of ten minutes to prepare (grind, heat water, pour, seep, taste, etc), but you can get something close in minutes with VIA. 1) It is a refreshing 21st century take on the old instant coffee of yester-year. 2) VIA looks nothing like what is on the market: from the awesome slender pocket friendly packaging to the real coffee look of the product. 3) VIA comes with the wonderful Starbucks buying experience that we love of their retail stores. Baristas with smiles simply can’t compete with the grocery store clerk when you buy Folger’s. 5) It is great to take with you. The ultra-portable and stylish packaging fits in your pocket/purse and all you need is a cup and some hot water. That stale workplace coffee will be getting even more stale with VIA Ready Brew in your cup! While I was skeptical of VIA in the beginning, after spending one week with these little packets of awesome coffee goodness, I really think Starbucks have shaken up the instant coffee market by bringing us a pleasantly refreshed version of my grandparents hideous crystals. What do you know… Starbucks has still saved us from instant coffee nightmares!